Community Recap: Chair to Dance? “Geothermal Escapism” was just a whole lot of fun, and a very fitting send-off for Donald Glover’s Troy. 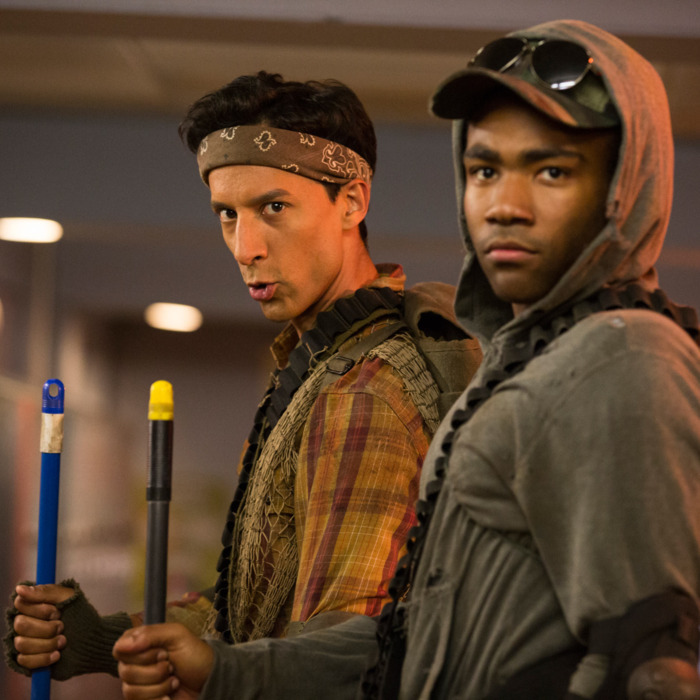 We’ve all known Glover’s departure was imminent, and last week’s “Cooperative Polygraphy” pulled off a lot of heavy lifting in not only managing a truly funny and emotionally appropriate farewell to Pierce, but in setting a new path for Troy, whose man-child romps with Abed had perhaps become a tad stagnant. “Geothermal Escapism” not only provided us with a bunch of laughs from its outlandish situations, but also addressed Abed’s emotional stress of having to deal with his best bud of the past four years embarking on a journey that doesn’t include him. I appreciated the shift from Britta’s psychotherapy being a constant punch line — which has certainly netted its own share of yucks — to an actually useful and accurate skill; from the beginning of the episode, she’s calling people out for masking their anxiety about Troy with humor and giddiness, and for once, she’s not just “Britta-ing” the situation. Once the lava game begins, her role becomes that of an emotional truth renegade, fighting her way through the ridiculousness in order to get Abed, for once, to actually confront his fear. By the time she reaches the endgame, and Abed commits lavacide, she realizes that at least on some level, she has to join them to beat them, and Gillian Jacobs handled the whole play-cloning sequence with Troy beautifully, at once finding a way to get Abed to accept the situation and helping Troy realize that while he may never truly be able to get inside Abed’s head, he still understands him enough to help ease his pain. I think the show has a tendency to go to the “Britta is the worst” well a bit too often, and it was nice to see her have a chance to be right, and not necessarily rub it in anybody’s faces. She even got a nice nod in her good-bye with Troy, where she calls herself “the worst,” and Troy tells her she’s actually the best and he loves her. Aw. Sniffle. Community’s paintball episodes have been some of the show’s best (well, except for the “dark timeline” version from season four’s finale), and even though yet another schoolwide gaming adventure could have proven tiresome, the circumstances surrounding this one breathed new life into the concept, and the outcome was hilarious. As with the previous paintball episodes, once the game begins, it takes little to no time for everything to devolve into postapocalytic, Mad Max–ian chaos. Groups of roaming bandits and desperados form, and situational lingo evolves: We have characters “centipeding” and “inchworming,” and we get gems like Jeff calling chairs “plastic gold, four-legged diamonds,” and Annie saying: “feast your feat on that stack of sticks.” It really struck me that the writing team for this episode had the idea, and then actually tried a game of Hot Lava to see what would naturally evolve. I can just picture Dan Harmon duct-taping his feet to some plastic chairs and wielding toilet plungers. Also, Troy and Abed’s entrance in the hallway was outstanding, as was the ensuing argument with Chang about his roaming ragtag crew hogging the phone bench: “You used that bench to upset the balance; by the vapors of Magmarath, we will restore it.” And when Britta replies, “You have gods?” it’s just hilarious, because they’ve already taken the conceit so very far. When Troy and Abed leave Britta in the hallway, Troy’s line “I’ll always remember you slowing us down and complaining a lot” slayed me. Here’s another perfect use of Ben Chang; I was not a fan of the Chang-nesia thing from last season, but I feel like they have found his place again in the show. He’s always been a great three-minute maximum presence; limited doses of that character go a long way. His imminent lava-death confession about Nathan Fillion being his celebrity crush was great. I didn’t totally love the clunkiness and unnecessary over-re-exposition of the good-byes. They felt weird, especially with each person recapping their whole relationship to this point, like with Annie and Shirley. But I did like Jeff’s good-bye (and I also never knew the show took place in Colorado; I thought it was sort of intentionally vague. Maybe we all knew that before, and I’m not a good enough fan, but that would explain why the Childish Tycoon had to be driven to Troy, instead of Harmon & Co. contriving a situation to take all the characters to a coastal town to bid Troy adieu), and I loved Abed adding that he spliced some of Troy’s DNA with a carrier pigeon’s so he’d have the side effect of wanting to return. Again: sniffle. I also really enjoyed that Pierce, posthumously (or before his death), had decided LeVar Burton was going to be Troy’s second mate. It was fitting for a number of reasons, but mainly because it goes to show that Pierce really did care and he really did listen. He was not the sort of all-around jackass that a lot of people think he was. Overall, another winner for season five. * “Imagine what the floor looks like!” “I don’t have to, I’ll just imagine where you’re about to be!” “That’s the same as imagining the floor.” Britta’s intentional “Britta”-ing that dialogue was insanely funny. Another example of her turning her perceived weaknesses into strengths in the episode. * Too many others, and plenty I’m sure I missed entirely.